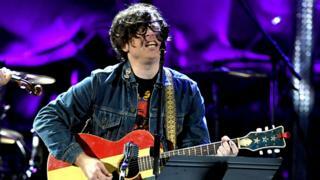 Fans of singer-songwriter Ryan Adams are demanding their money back ahead of his upcoming UK tour. Following accusations of sexual misconduct, some fans say they don't want to go to his concerts until the allegations are proven or discounted. In a recent report, several women also accused him of psychological abuse. The FBI is looking at whether he sent explicit text messages to an underage teenager, something Adams has said he "unequivocally" denies. Adams' forthcoming album has been put on hold but tickets for his UK dates are still on sale. This has left some fans taking to social media to demand a refund from music venues and ticket companies. Emma Buff from Peterborough spent just under £50 on tickets to see Adams perform in April and feels "quite shocked" by the allegations made against him. "Reading the allegations upset me quite a lot and I decided I didn't want any of my money to go to Ryan Adams in the future," she said. "I've tried to get a refund on the ticket [and] I've yet to hear anything back" she added. Emma says she has been a fan of the musician for a long time. Due to the recent claims, though, she is now more wary of whom she chooses to support. "In the current climate we live in now, I definitely think about who I want my hard-earned money to go to... and I do think the whole [music] industry needs to look at itself." In an interview with Radio 4's You & Yours programme, New York Times European culture journalist Alex Marshall said there needed to be clarity on the issue from the music industry. Marshall said it was "surprising" that the companies involved in the tour have been silent since the allegations were published. "I've tried to speak to the ticketing companies," he said. "I've tried to speak to the venues and the promoter and I've had very little response back. "That's leaving people in the dark about what's going on." In cases where allegations have been made against an artist, consumers are not legally entitled to their money back. Ticket holders would only be entitled to a refund if the organiser cancels, moves or reschedules the event. Kate Hobson, Consumer Expert at Citizens Advice, said: "Ticket holders who change their mind for whatever reason about going to see a concert have no legal right to a refund. "They could try reselling their ticket, but they should first check the advice on reselling on the Citizens Advice website." For the most part, artists and bands that have faced similar accusations have withdrawn plans to tour. In the case of Ryan Adams, Alex Marshall believes a delay in response as to whether the tour will go ahead as scheduled is down to many of the ticketing companies, venues and promoters who stand to lose money if the performances are cancelled. "There seem to be some artists that believe they can keep going, no matter what's been said about them. "But what you're hoping to see with the #MeToo movement is that people are raising these accusations, which will lead to a change in culture to make people aware of what's gone on in the past and what is deemed unacceptable." Three music companies have already severed ties with the indie rock star. In a statement on social media, Adams said he was "not a perfect man" and had "made many mistakes." Yet he said the New York Times' article, which first raised the allegations, had painted an "upsettingly inaccurate" picture and that he "would never have inappropriate interactions with someone I thought was underage."